Bachelor's Button is an annual version of the Mountain Cornflower plant. It is an easy to grow plant that will quickly form a nice clump of lance shaped, silvery-green foliage. 1½" flowers in late spring and may continue blooming well into fall. Bachelor's Buttons are also known as Cornflowers or Blue Bottle. They prefer to grow in full sun, but will tolerate some light shade in the afternoon. 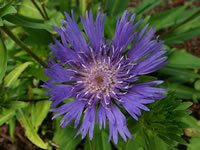 Plant Cornflower bedding plants 6"-12" apart in the garden any time after all danger of frost has passed. Cornflowers can be planted in any average to rich garden soil, provided that it is well draining. Water moderately during extended dry periods. Otherwise, once established, Bachelor's Buttons are fairly drought tolerant plants. Be sure to remove spent blooms regularly to induce continued flowering. Centaurea seeds need complete darkness to germinate, so be sure to cover them well. For spring blooms, sow Bachelor's Button seeds directly in the garden as soon as possible after the last frost date in your area. Succesive plantings will prolong your blooming period. Sow Bachelor's Button seeds indoors 4-6 weeks before planting them in the garden. Maintain a temperature within the growing medium of 60°-70° F.